Halo 4 Infinity Challenge is LIVE! The Halo 4 Infinity Challenge is underway! It’s a free to enter tournament allowing all skill levels to compete in War Games, Spartan Ops, and Weekly Challenge global leaderboards. It’s simple all you have to do is register on the website. Sign into your Xbox Account and grant the permissions requested. Once that’s done all you have to do is start playing Halo 4! There are more than 2,800 prizes to be won! There are different stages within the challenge. December 17th 12am EST to January 10, 2013 11:59 PM EST will be the qualifier phase, which will result in three tiers of players based on your results. Tier 3: the last 60% of players competing. won. 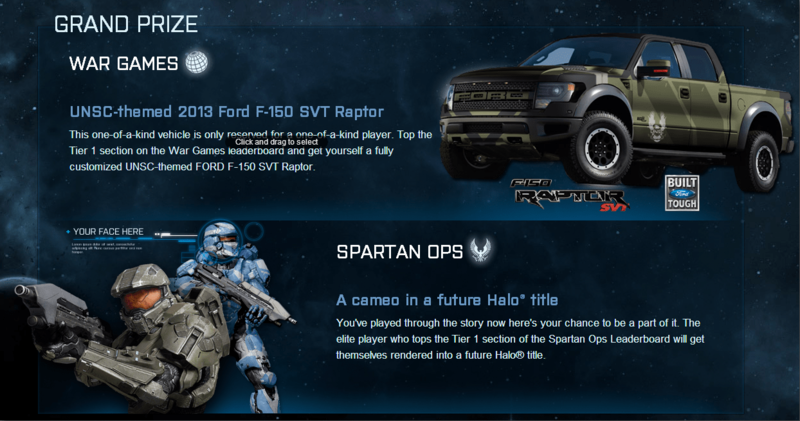 The War Games leaderboard winner will walk away with a UNSC-themed, 2013 V8-powered Ford F-150 SVT Raptor truck, or an alternate prize of $25,000. The Spartan Ops leaderboard winner will secure an appearance in a future Halo game. The Finals phase will start on January 12 and end on January 19. During the Finals phase, the leaderboards will be reset and prizes will be awarded to the top performers in each tier. While terrific prizes are available within all three tiers, the grand prizes will be offered exclusively to those who have battled their way to Tier 1. This week’s playlist change is Infinity Slayer, changing it to Infinity Challenge Playlist. With absolutely no settings changed, just to allow for easy leaderboard comparisons. It’s still the same Infinity Slayer we all know already. Note that you do not have to participate in the Infinity Challenge in order to play in the Infinity Slayer playlist. To check out the War Games leaderboard, click here. To check out the Spartan Ops leaderboard, click here. To check out the Weekly Challenge list, head here. For more information about the Infinity Challenge, to sign up, or to check your progress, head to Halo4InfinityChallenge.com. This tournament is so simple and shouldn’t be overlooked. All you have to do is play Halo 4!